I did my first-ever email list giveaway this month, and it was a success! The darling Midori got her package and was very squeeful about the plethora of goodies inside. 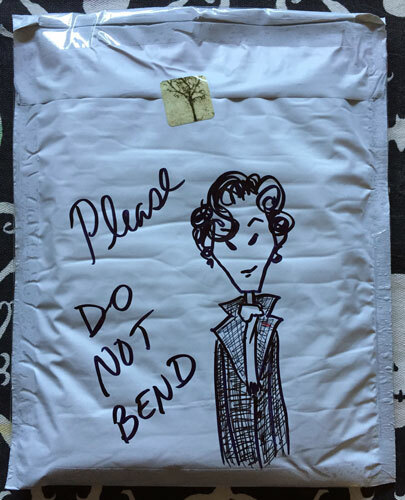 The giveaway thing started out as an excuse for me to send more mail — people on my email list can opt to give me their snail mail addresses to get entered in a monthly drawing. I’m also going to try to get some birthday cards going out, and maybe something special for next Halloween (my favorite holiday!). I wanted to give generously and not just one or two things — something that would really bring delight and awesome happiness to my people. 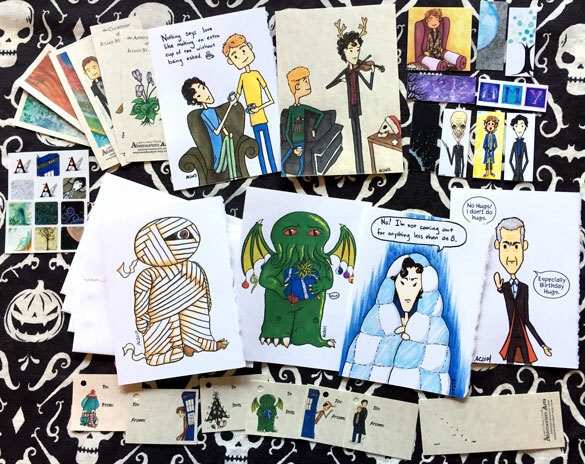 The splendidly wicked Evil Supply Co.* sends out a bunch of freebies every month, and after winning a whole Mr. Ghost’s Monthly Parcel (The Raven!) and being totally shocked at the amount of swag in there, I wanted to pass that feeling on to my beloved readers, customers, and patrons. In addition to cards, bookmarks, gift tags, and some of my awesome Moo minicards**, there’s a couple of things you can’t get anywhere else — stickers, prints, and one of my even awesomer square Moo cards, which are like high-quality mini art prints.